Gallery RIVAA warms late winter on Roosevelt Island with news that it will be reopening, holding to tradition with its seventeenth annual Vernissage exhibit. This year, the show has more impact as the artists' collective brings creative energy back Main Street after a three-month absence. Vernissage, literally "varnishing," is a French term typically used for a preview of an art exhibit. Here on Roosevelt Island, its meaning is broader, indicating a rich perspective on local talents that will invigorate 2018 in numerous shows at three Island galleries as well as in leading events like Fall for Arts held in conjunction with RIOC. 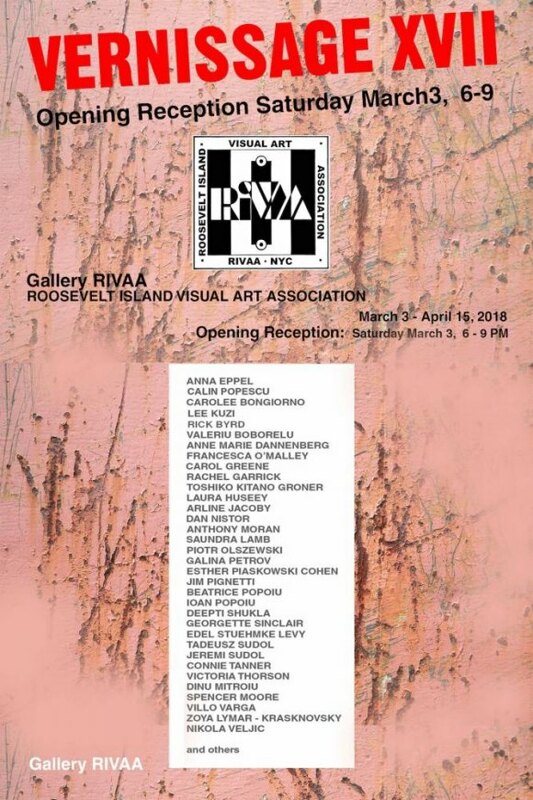 The Roosevelt Island Visual Art Association invites you to a free Opening Reception this Saturday, March 3rd, from 6:00 to 9:00 p.m. in the gallery at 527 Main Street, immediately adjacent to Good Shepherd Plaza. The exhibit will delight your senses from March 3rd until April 15th.